Luxury 3 bedroom bungalow sleeps up to 6 persons, a small child and 1 baby. Set in a 500sqm plot, it features an outside built-in charcoal BBQ, grassed area and hibiscus hedges, private 9m x 5m swimming pool and private parking. Fully furnished open plan lounge/dining area with comfortable sofas and coffee tables, stereo, ipod station and broadband internet. Leading out through large double patio doors, covered pergola to the garden and pool area. Fully equipped kitchen with dining table and seating for 6 . Main and en-suite bathrooms with walk-in shower, vanity unit with hand basin & w.c. All 3 bedrooms have queen size beds, bedside tables and fitted wardrobes. All linen and towels provided, except beach/pool towels. Fully air-conditioned throughout and shutters on all doors and windows. 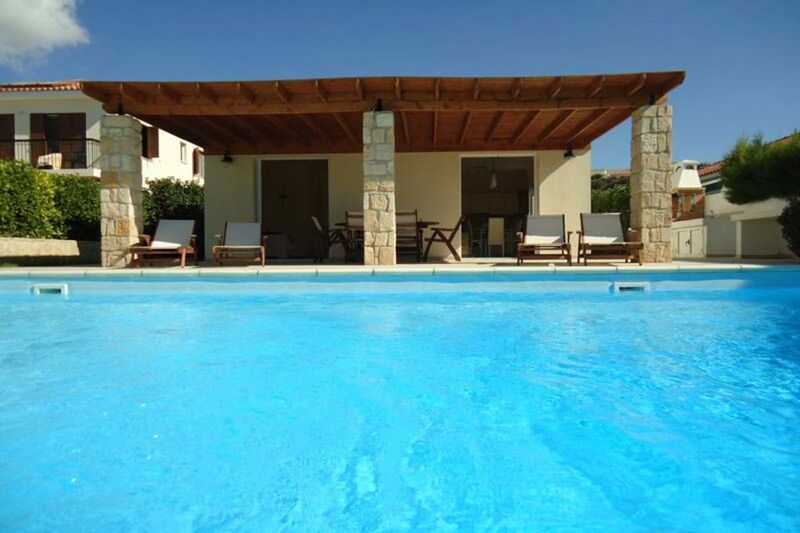 We have other villas very close, available for friends and families who wish to stay close by. 'Katikies' is a unique development in beautiful Pissouri Bay consisting of individual, private luxury villas and bungalows to cater for everyone's needs. A perfect haven to relax and unwind, enjoying the scenic views of the Mediterranean Sea and Troodos Mountains. Convenient location to shops, minimarkets, bars, traditional Greek tavernas, fish restaurants, snack bars and bank. Flat 150m walk to the Blue Flag beach with water sport facilities and the 5 Star Luxury Colombia Beach Resort. NO smoking inside the property. Outside smoking only. This property is in an excellent location. 25 mins from the airport, a quiet cul de sac, a small supermarket round the corner, several decent restaurants within 10 mins walk and the beach 5 mins away. Pissouri is a pleasant little resort, nice clean sea and not tacky though not with any special charm. The village of Pissouri does have more charm and is about 5 mins drive away. The house itself is spacious and has everything you need though I wouldn't call it luxurious. The pool is a good size and the terrace is a pleasant place to sit. There are near neighbours but you are not at all overlooked. All in all it is a pleasant place to stay. Two families 8 persons in total Arrived very late in the evening to discover not enough beds! In an email prior to arrival we had requested the cot be changed for a fold up bed. Therefore 2 fold up beds and 3 double beds. Website states sleeps 8. Arrived to find just one fold up bed. Rang the out of hours number to be told nothing could be done that evening. My son slept on the sofa for the first night. Not a good start. The person I rang regarding the beds said the villa sleeps 6 not 8. They provided another fold up bed the following day. We found the washing machine not working but this was fixed by the end of our first week. The villa is well equipped with everything you could need. Fab pool Pool man came in twice a week. The location is great very close to beach and small shops for convince foods. Lots of bars and restaurants. We tried most of them. Pissouri Bay cafe is great for burgers and cocktails. Car is needed to get to the main supermarket at the top of the Pissouri village. All my family (2 adults, 3 boys aged 5, 8 and 14) spent some very pleasant hollydays in this large and convenient Villa, clean and very well maintained. There is a grocery at 80 m and a nice Cypriot restaurant at 50 m (the enthusiastic manager, Athos, speaks a verry well French). Julie will support you from the customer service office at 100 m. I hope to come back in 2 years ! A lovely property in a family orientated village. This was a first private rental for us and we purposely chose to rent this one as it is owned by a company making the whole bank transfer thing that little bit less risky! The transaction process was seamless and we were given plenty of information for local amenities etc. Julie was especially helpful and very kindly allowed us to have a late check out to help with the late evening flight we had. The property itself is lovely! It's well maintained, has all the amenities you could want and is very private. The owners were keen to make sure everything was ok and were very friendly. The village itself is fairly low key and suited to family holidays. There are plenty of shops and restaurants in the locality and a larger supermarket 5 minutes drive away. This holiday and rental was a great experience and I would highly recommend this villa and company to everyone! We stayed at this property for 5 days in Jan 2013 with our two small kids. Everything was top notch. We were met at the airport as promised by a very friendly fellow who took us to the property while explaining a lot about the island culture on the way as he was local. The property looked and felt much better than the pictures. First of all, while this might technically be a townhouse, I would call it a full terraced house in a compound with 4 units. It is the middle unit with no direct views into the apt from the neighbours and it is well elevated over the pool and relax area (my guess 8 meters) so privacy is assured. The other three tenants were long time renters who were from three diff Caribbean countries and it was great to get to know them. Actually, the next door neighbour was head of the lower house of St Lucia (!) but you could never tell from his very friendly and humble attitude. Anyways, back to the property: First of all, the view over Rodney Bay from both of the huge balconies on lower and upper level are breathtaking. One also has a view of the lush green hills around, hear birds sings throughout the day and get the gentle Caribbean breeze as one enjoys a drink or a meal on the balcony. All furniture and appliances in the unit were high standard/luxury and not a detail was forgotten. Kitchen is beautiful with a granite top, fully equipped with all pots pans etc.The two en-suite bedrooms are both very good sized with AC should one need it. Also very nice to be staying in a real neighbourhood with local residents and not be trapped in a tourist only area yet just have five minutes to the most tourist develop area in St Lucia namely Rodney Bay with excellent beaches, shops and restaurants/bars. Last but not the least, the owners Pinkley and Jessica were very friendly, accommodating and kind. We loved the fact that they dropped by to check on us the second day just to make sure everything was working well. Also thanks to Pinkley for his tip on Fish Fry at nearby Gros Islet on friday nights - it should not be missed! All in all, we loved our stay here and love to come back soon again. Highly recommended! Pissouri Beach is a mixture of sand and pebbles.It carries the EU Blue Flag for cleanliness, with safe swimming, life guard on duty, a beautiful unspoilt bay.Sunbeds and parasols can be hired in the summer months.Water sports for hire include jet-ski, wind-surfing, snorkelling, sailing, paragliding and water-skiing. Small boats can also be hired if you want to discover other coves around the coast. Pissouri is located on the South Coast of the island and is very laid back and relaxed, ideal for those that want to unwind and revel in the peacefulness of the resort. Pissouri Village has managed to retain its traditional Cypriot charm. With sultana grapes covering the surrounding countryside, this is one of the principal wine growing regions of Cyprus.To the north of Pissouri village, one can see the majestic Troodos Mountains and to the south and east there are panoramic views of the coast, across vineyards, carob and olive trees. Golf: With three championship courses on the island, Cyprus is becoming increasingly popular for golfing holidays. Although all three courses are conveniently situated within a 20-minute drive of the villa, each one is very different and offers an excellent variety of challenging holes and beautiful views. Secret Valley Golf Club - 10 Minutes drive - Lies in a scenic valley surrounded by beautiful sculptured rock formations near Petra tou Rominou, the legendary birthplace of Aphrodite, the goddess of love. The clubhouse is a rural Cypriot designed building with locker rooms and includes a pro-shop, restaurant, bar and golf academy. Aphrodite Hills Golf Club - 10 Minutes drive , has been carved out of carob groves and olives trees on two high plateaux divided by a dramatic ravine. Designed by world-renowned Cabell Robinson, it boasts spectacular views overlooking the Mediterranean Sea together with generously wide fairways. The clubhouse offers an elegant and intimate ambience for private parties, corporate events and romantic wedding celebrations. MINTHIS HILLS GOLF CLUB - Is situated in the hills around the village of Tsada,15 km north-east from the city of Paphos. Ski: Cyprus it's also popular as a winter skiing destination,. Between January and March, it snows on the top peaks of the Troodos Mountains. There are 10 ski runs and several cross-county trails, which are suitable for beginners, intermediates and advanced skiers.